There are few more glorious words in the German language than “Feiertag”. It is a word that rolls off the tongue and spreads joy to anyone lucky enough to hear it. Why? Simply put “Feiertag” means public holiday a bonus day of freedom to be used however you see fit. Want to stay in bed? No problem. Fancy climbing a mountain? Go ahead. Want to play video games in your pants and eat six tubes of Pringles? I wouldn’t recommend it, but whatever floats your boat! In some ways, German public holidays are like a bonus Sunday, the shops are closed and in more conservative areas there are restrictions on noise levels, which means no serious housework or cleaning can be done either. Many people complain that Germany has too many rules, but few would claim that forcing people to take time off was an over reach of bureaucracy. One of the more surprising aspects of the German system of public holidays is the fact that there are so many. Considering Germany is regarded as one of the most productive countries in the world, it is amazing to think that they do this and still include nine official national public holidays every year (including Easter, Christmas and New year). This year, thanks to the 500th anniversary of the start of the Reformation, we actually have ten public holidays, yet even with this bonus national day off, we still haven’t covered all the available holidays. Germany also has regional national holidays, which range from localised city holidays to whole states. For instance, here in Bavaria, we have four extra public holidays taking us to a whopping 14 public holidays for 2017. To put this into perspective, in the UK my friends a family enjoy a maximum total of 8 Bank Holidays. Although Germany still lags behind India (18), we can be happy that we are doubling Mexico’s minimal 7. The regional nature of mandatory days off means that it pays to do some research on which areas of Germany offer the best options, but it must be remembered that when I say regional holidays, I mean very specific regional holidays. An example of how regional it can get would be the August 15th celebration of Mariä Himmelfahrt which takes place in Bavaria and Saarland. 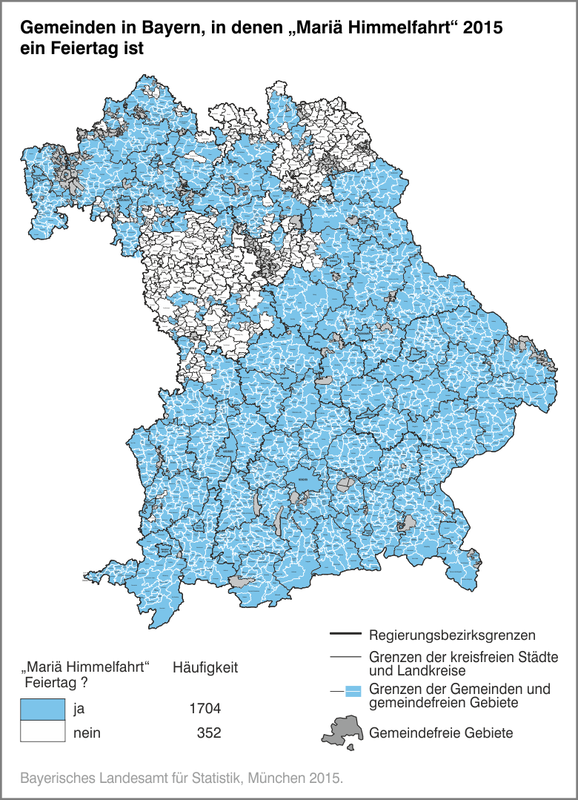 Despite the fact I live in Bavaria, I have never taken the 15th August off, because although 1704 areas within Germany’s most southern state do have a public holiday, I happen to live within one of the 352 that do not. If I had moved 20km down the road, I would be enjoying 15 public holidays in 2017. Then again, all the public holidays might seem great at first, but they come at a price. Unlike the UK, where public holidays are always on a Monday, Germany being Germany opted to stick to the exact dates. This means that should the public holiday fall on a Saturday or a Sunday, you lose your extra day off. Depending on the year, we could lose as many as three public holidays, which means we could drop below Mexico in the table of the fewest days off. Unsurprisingly, Germany has come up with a solution for losing days off by simply creating the “Brückentag” or bridge day. The concept of the bridge day is simple: say the public holiday falls on a Tuesday or a Thursday, then Germans will use one of their many employee vacation days and bridge the gap between weekend and public holiday, giving them a monster four day weekend. Productivity isn’t just about producing record numbers of cars, it also extends to producing absurdly long weekends. Imagine how many Pringles they can get through in four days? I’m surprised there isn’t a national shortage. So what does this all mean? Well, if you intend on visiting Germany, make an effort to check if your holiday coincides with one of the many public holidays. All the restaurants and bars usually stay open, but if you were planning on some retail therapy, you’ll be out of luck. If you are planning to move to Germany, don’t just choose the coolest looking place. Sure Berlin might be full of haircuts and bountiful beards, but those suckers only get the basic 9 public holidays. Here in the south, you may encounter some weirdness and a general backwards attitude to human progress, but you could have as many as 15 days off extra a year. Surely that’s a fair exchange? In addition, learn the art of the Brückentag and book them early, no one wants to be sitting in work on their own. I mean, unless your job has a relaxed attitude to you working in your underwear, covered in Pringles dust.